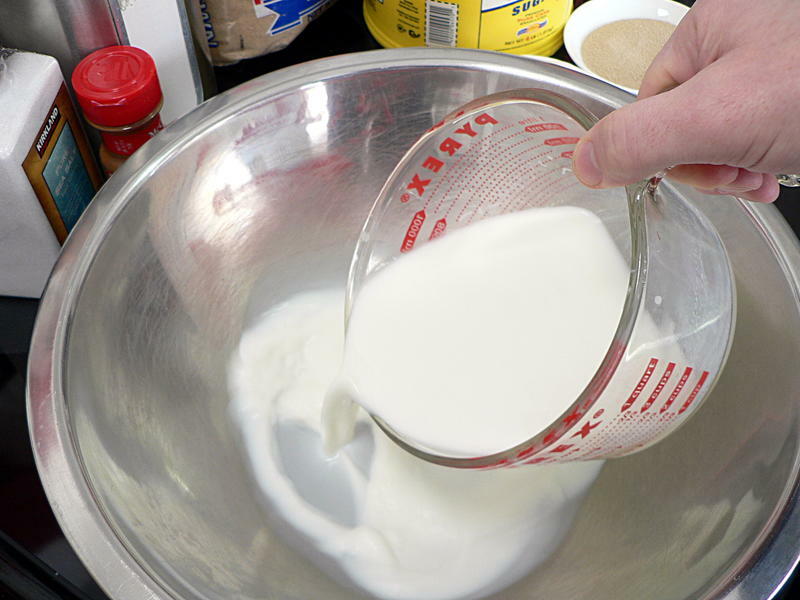 Warm the milk until it is a bit warmer than room temperature but not hot. 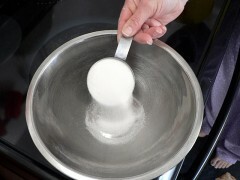 About 90°-100° F. if you have a thermometer. Sprinkle the yeast in and mix. 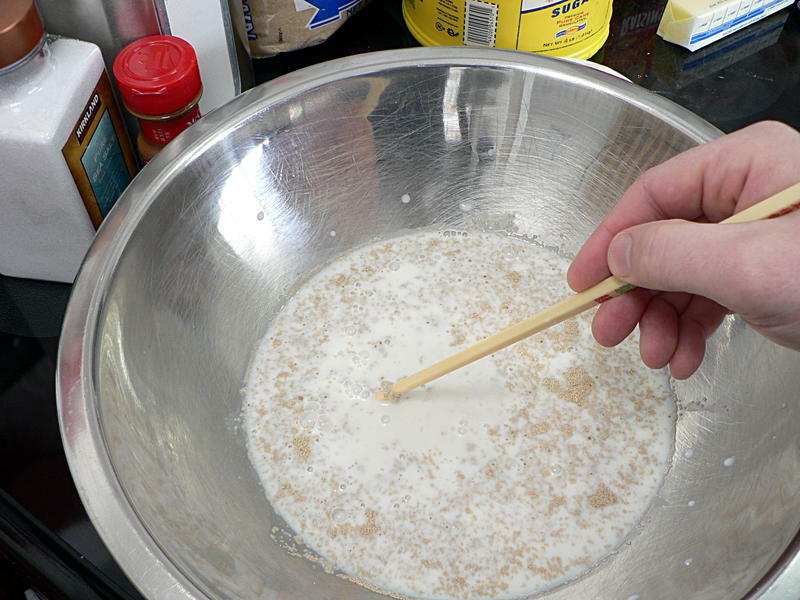 I use a chopstick to mix yeast because it gets very sticky, and there’s less for it to stick to. Use a spoon and half the yeast will get stuck to it. Next add the sugar, salt, eggs and butter (melted but not hot) and stir. By the way, the reason I’m going out of my way to say the milk and butter shouldn’t be hot is that you can kill the yeast and the dough won’t rise. 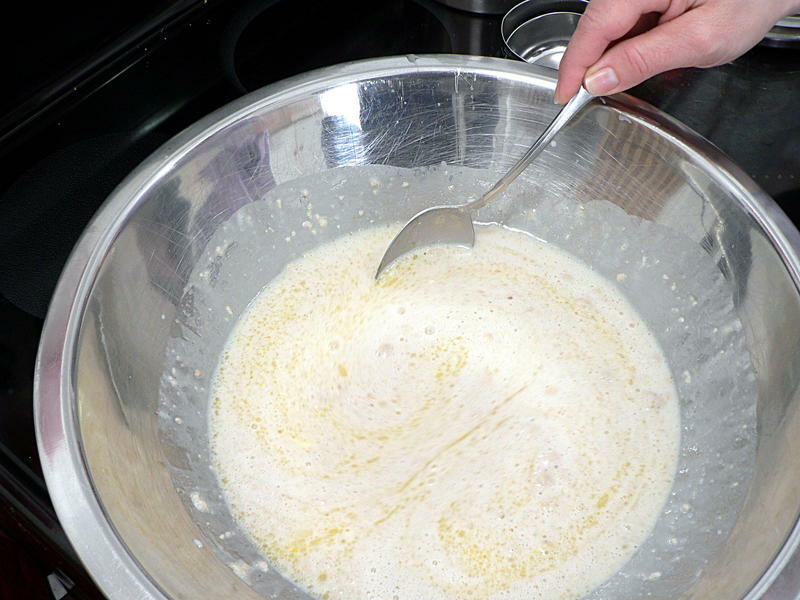 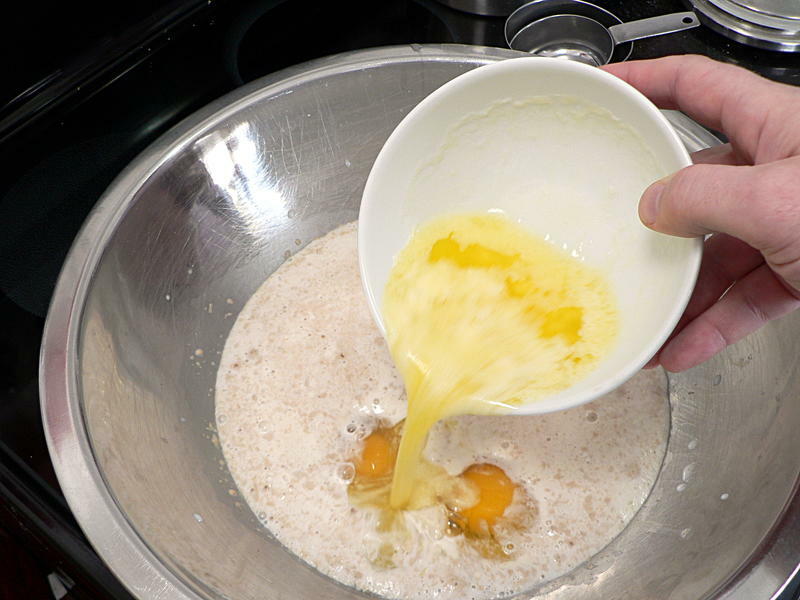 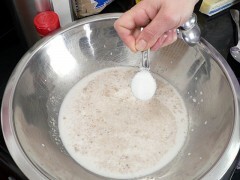 Before you start adding the flour, let this wet mixture sit for about 5 or 10 minutes. You should see bubbles coming to the top, that’s how you know the yeast is doing its thing. 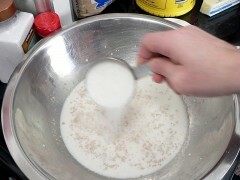 Add the flour 2 cups at a time, stirring after the first two additions. 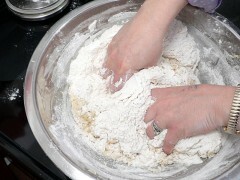 By the time you add the last amount you’ll need to start kneading with your hands. You want to add just enough flour that you can work it, but it should still be a little sticky. 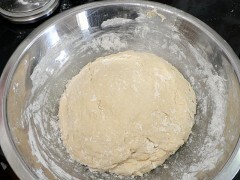 Once it’s smooth and stretchy, cover the bowl with a wet (clean) dish towel and set somewhere warm to rise. 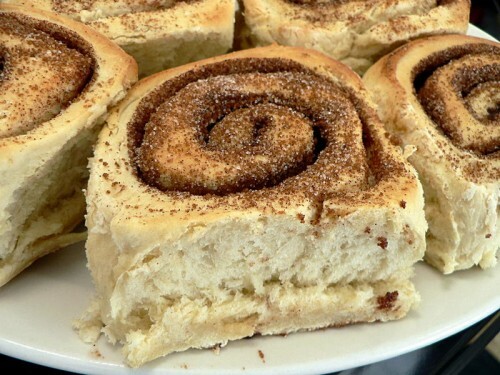 If you’re making this in the winter, turn your oven on for about 30 seconds then shut it off. 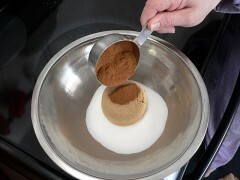 Put the bowl in there with the light turned on. 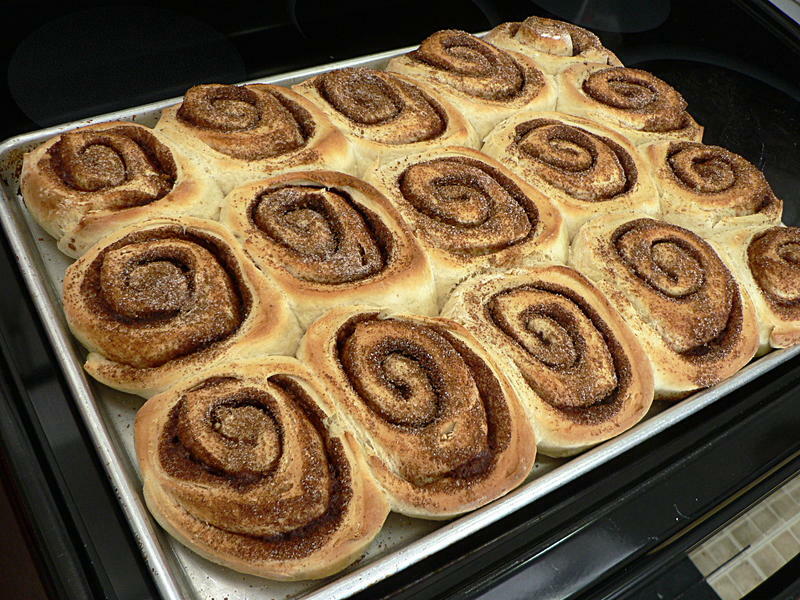 That will keep it just warm enough. 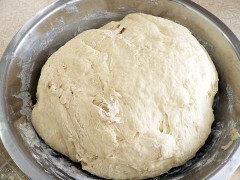 Let the dough rise until doubled in volume, about 45 minutes to an hour. 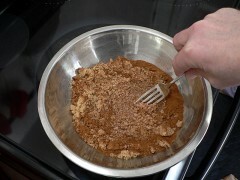 While the dough is rising, combine the sugar, brown sugar and cinnamon and stir, breaking up the clumps with a fork. When the dough has doubled in volume, punch it down, turn it over, cover and put back in the warm place to rise until doubled again. 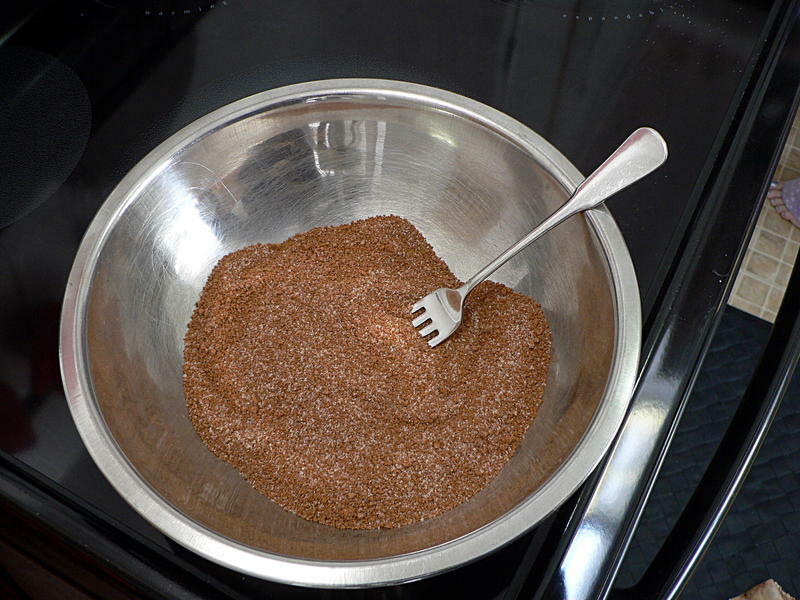 This time should only take 15-30 minutes. 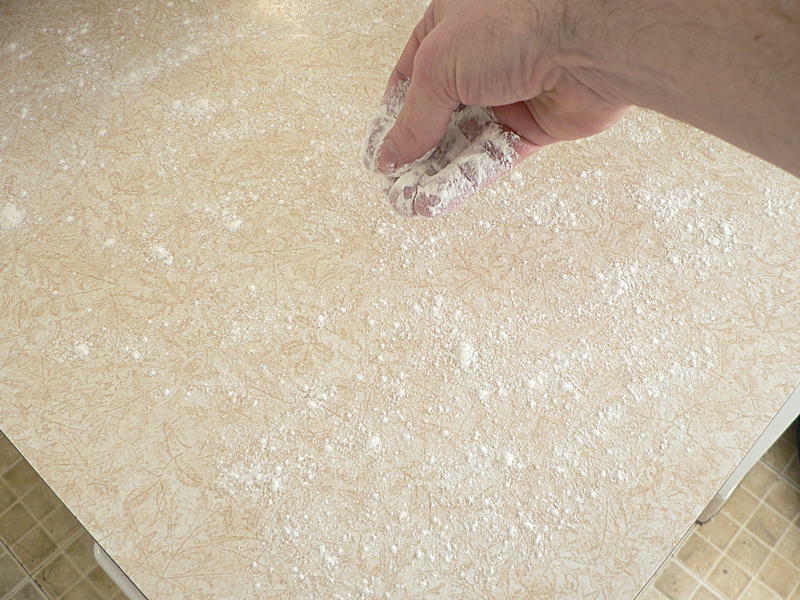 When it’s done, sprinkle some flour on a clean work surface to prevent sticking. Turn the dough out and roll into a rectangle about 18 inches long and and 12-16 inches wide. 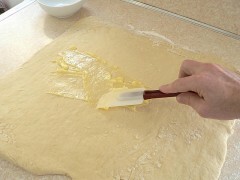 Soften the 2 tablespoons of butter (not melted) and spread on the dough. 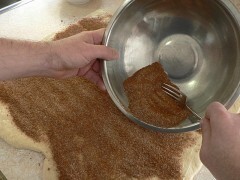 Top with the cinnamon-sugar mix and spread that evenly. Go all the way up to the sides, but leave a little space at the front and back edges. 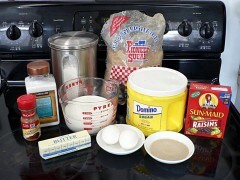 * Remember this asterisk. 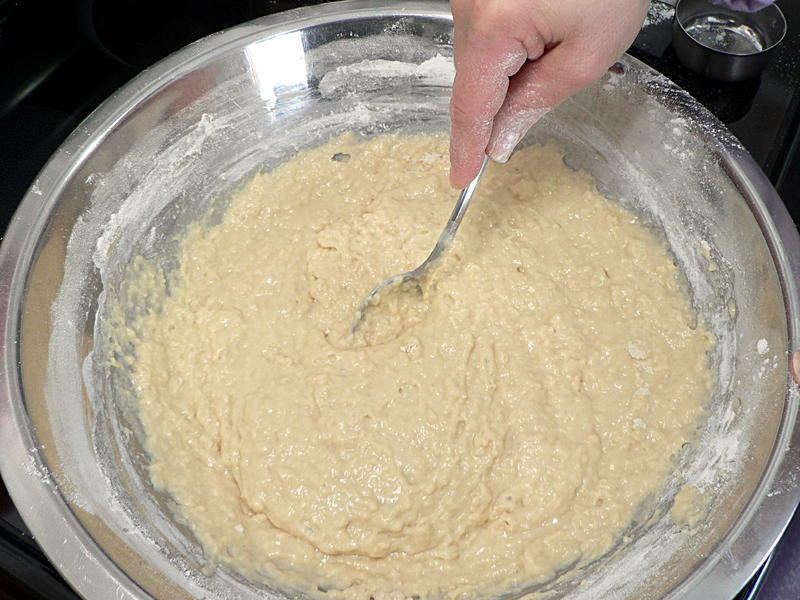 I’ll come back to it. 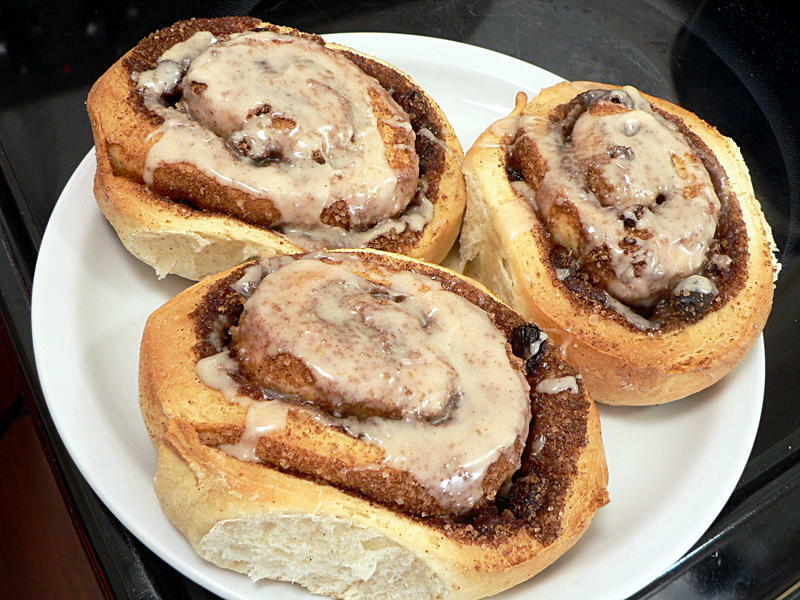 Roll the dough toward you, keeping it fairly tight. Cut into 16 even slices. Cut in half, each of those pieces in half again, and two more times. Transfer all the pieces onto a large, un-greased baking sheet. Scoop up the cinnamon-sugar mix that fell out and sprinkle it over the top. 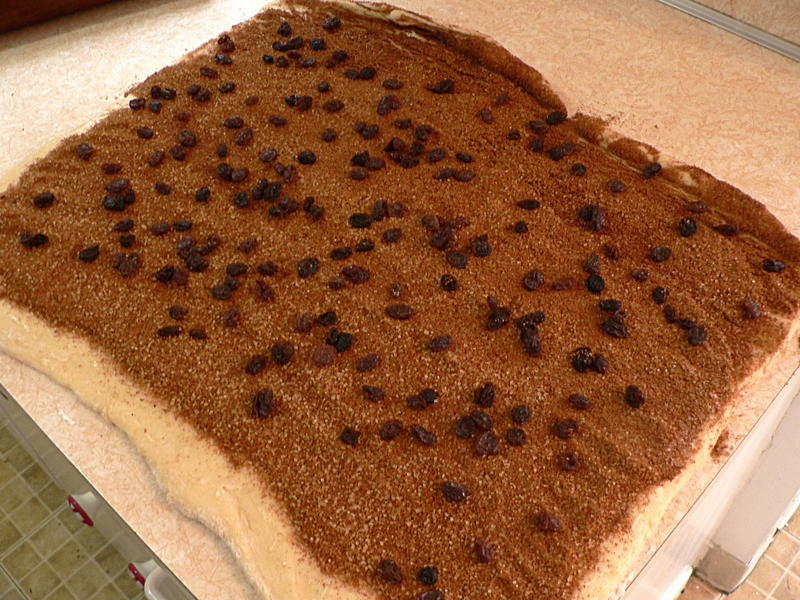 VERY IMPORTANT: At this point, look over and notice the box of raisins that you forgot to add. 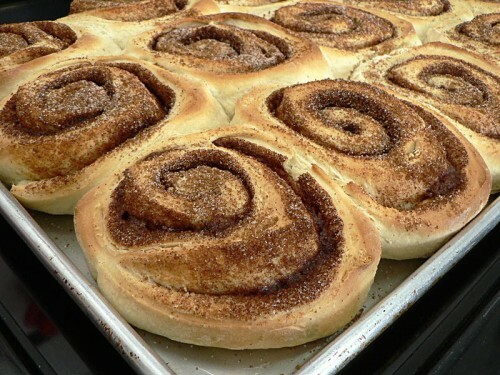 Say a bad word. Try to figure out if you can stuff them in without knocking all the filling out. Say several more bad words and decide to remember the raisins next time. 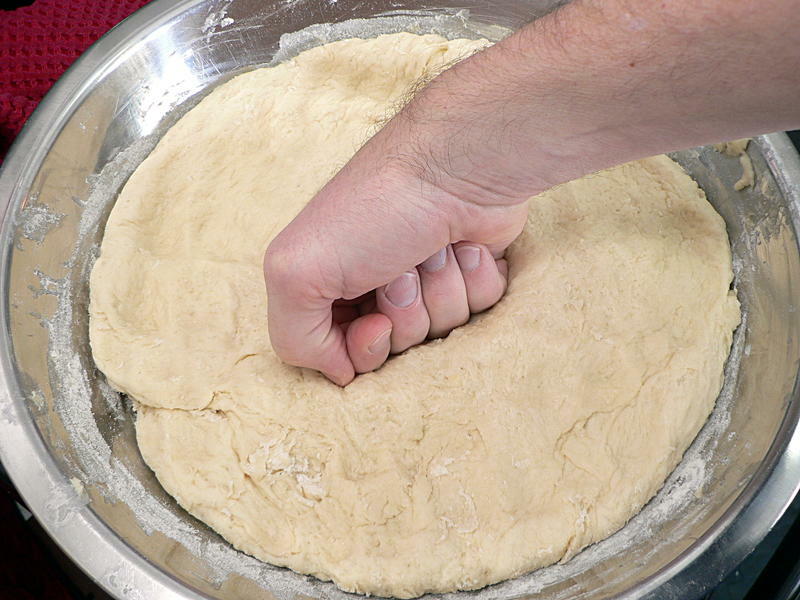 Go back to that asterisk above and do it there. 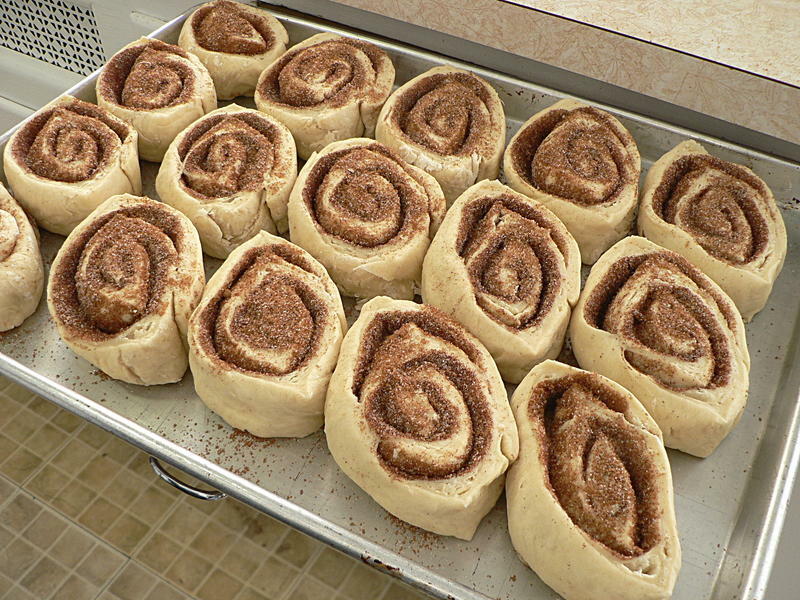 Bake for 30-40 minutes, turning the pan around after the first 20. 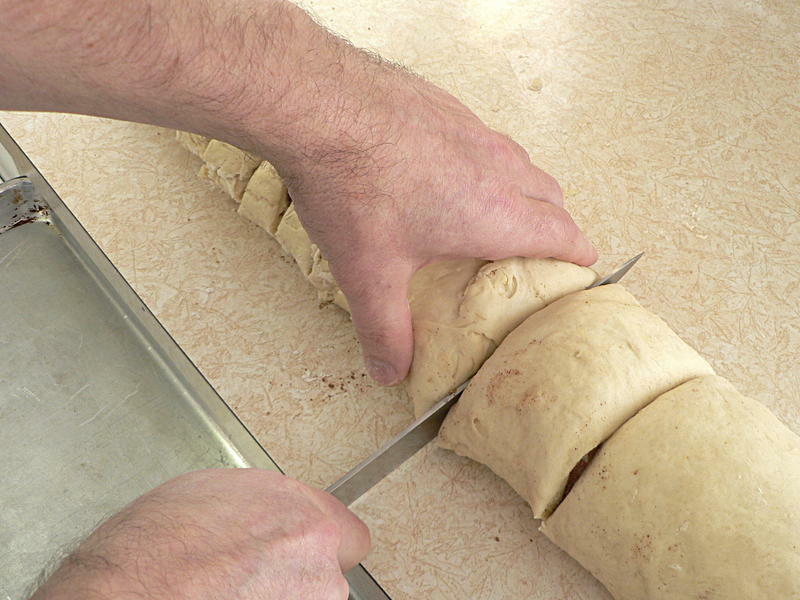 Pull them when the dough on the outside is golden brown. 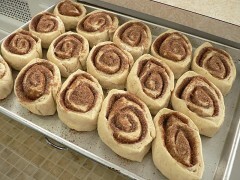 Pull them apart and place on a serving plate. 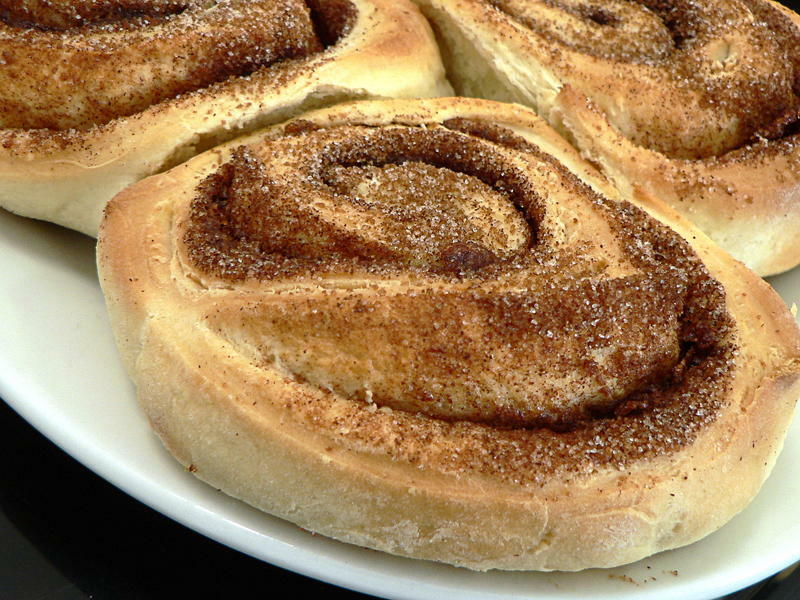 Stick around for the next update where I remember the raisins, add a cinnamon-orange glaze, and show how to make ahead and freeze so you can have them hot and fresh one at a time. UPDATE: So here’s what it looks like when you remember the raisins. And for the glaze, mix the juice from one small orange (or half a large one) with about a half-pound of powdered sugar and a teaspoon of cinnamon. 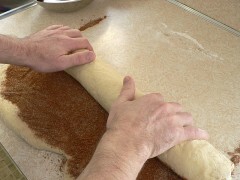 It’s not precise because each orange is different. Warm the milk until it is a bit warmer than room temperature but not hot - about 90°-100° F.Sprinkle the yeast in and mix. 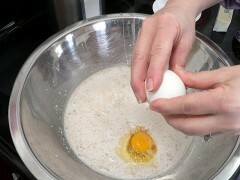 Add the sugar, salt, eggs and butter (melted but not hot) and stir. 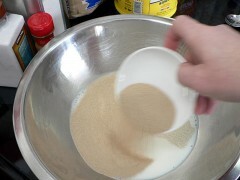 Add the flour 2 cups at a time, stirring after the first two additions. After the last addition start kneading with your hands. 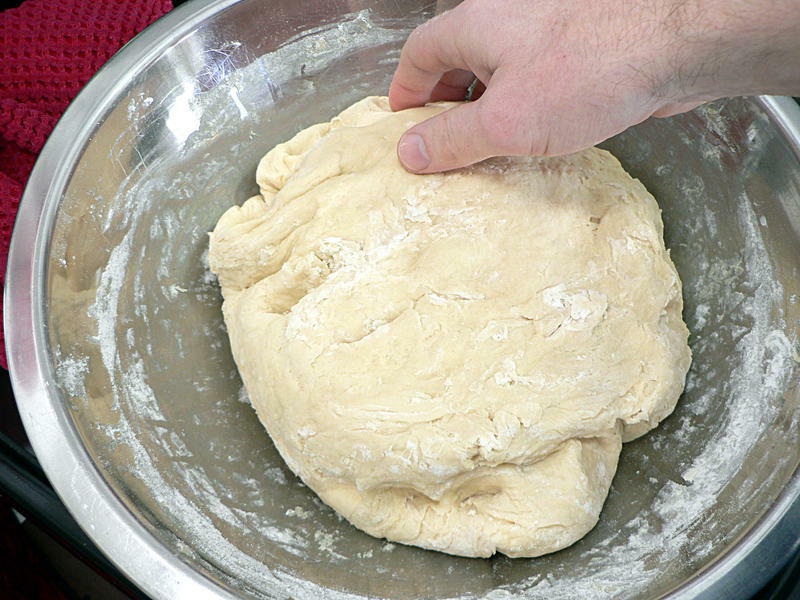 Cover the bowl with a wet (clean) dish towel and set somewhere warm to rise. 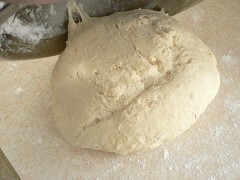 Let the dough rise until doubled in volume, about 45 minutes to an hour. 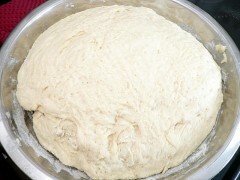 When the dough has doubled in volume, punch it down, turn it over, cover and put back in the warm place to rise until doubled again, about 15-30 minutes. 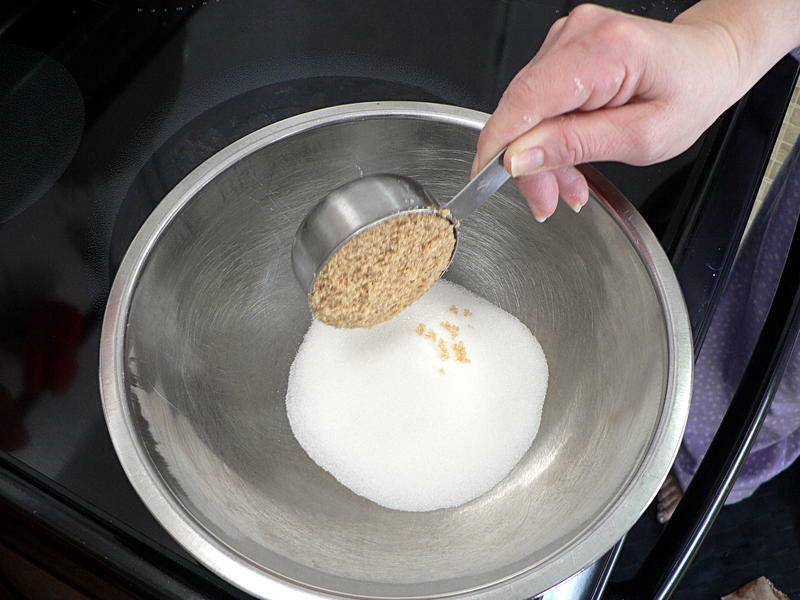 Combine the sugar, brown sugar and cinnamon and stir, breaking up the clumps with a fork. 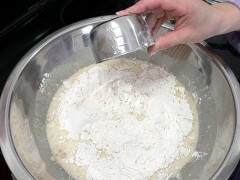 Sprinkle some flour on a clean work surface to prevent sticking. 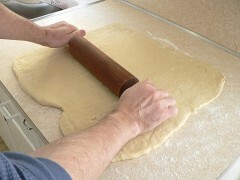 Turn the dough out and roll into a rectangle about 18 inches long and and 12-16 inches wide. Transfer all the pieces onto a large, un-greased baking sheet. 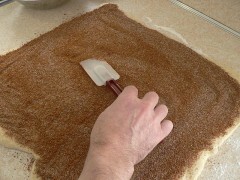 Top with cinnamon-sugar that fell out. 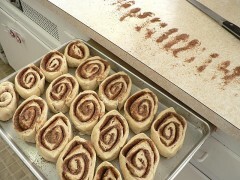 Bake at 375° F. for 30-40 minutes, turning the pan around after the first 20. Pull them when the dough on the outside is golden brown.